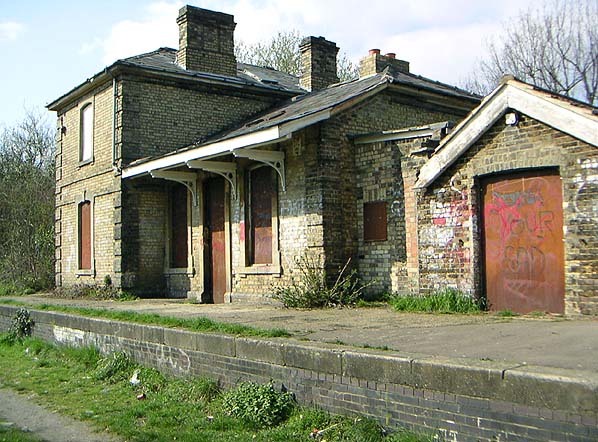 Present state: The station building and platform is still extant. The building is boarded up and unused and has suffered from vandalism and graffiti. The Flitch Way path runs alongside the platform. By 1860 most of the rail network was in place, leaving only the gaps between main line stations to be filled. Central and West Essex, a predominantly rural area, had been largely ignored during the initial development because it wasn't considered a viable proposition. In 1859 an unexpected proposal was submitted to Eastern Counties Railway by a group of Hertfordshire businessmen who were anxious to obtain easy transport for malt and barley from towns and villages in West Essex. Their proposal was for a railway line, 18 miles long, linking the towns of Bishop's Stortford, Dunmow and Braintree. They readily agreed to the proposal, offering to have the route surveyed and donating £40,000 to help with construction. The application was put to parliament and permission was given for the branch line to go ahead. In 1862 the ECR was amalgamated with the Great Eastern Railway (GER) but directors were adamant they would continue with the branch line. Despite poor local backing and the shortfall in subscriptions, the GER decided to fully finance the line themselves and absorb all of the shares of the local company. The first turf was ceremonially cut at Dunmow on the 24 February 1864 and contractors began work the following. Virtually the entire length of the branch line's 18 mile route was single track, except at Dunmow and one or two other stations where dual track allowed trains to pass each other. 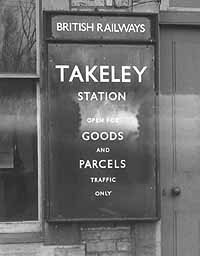 The line was finally opened for passenger use on 22 February 1869 with intermediate stations at Takeley, Felstead & Rayne. 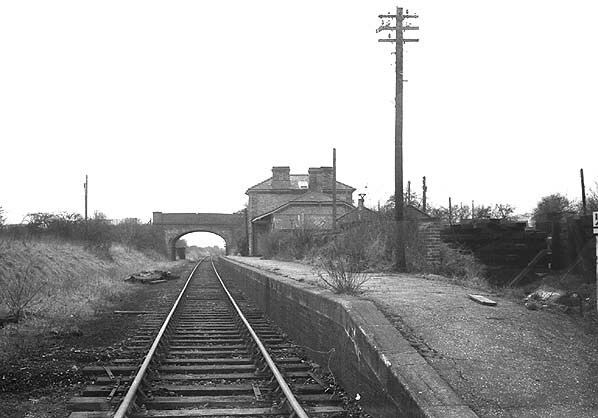 Further stations were later added, Easton Lodge in 1894, Hockrill Halt in 1910 and Stane Street and Banister Green Halts in 1922. With hindsight, it is now apparent that the branch line was never going to succeed as a profit making passenger service. The branch line's saviour came in the 1880s. The sudden demand for agricultural produce in London combined with new industries that were starting up in Braintree, both required a freight service and it was this that was to provide important revenue for the railway. Freight traffic continued to grow, especially at the Braintree end of the line, but by the end of the 19th century passenger traffic to Bishop's Stortford remained light. When the GER finally amalgamated with the London & North Eastern Railway (LNER) on 1 January 1923, the new company made every effort to increase passenger traffic on the branch line by doubling the initial three passenger trains a day running in each direction, to six. But all to no avail. It was still the carriage of freight that supplied the revenue. During the Second World War the line was used to transport thousands of tons of rubble for the construction of Saling airfield, 5 miles from Braintree and, later, when it became operational, massive loads of bombs were carried to the same destination under cover of darkness. The United States Air Force bases at Stansted and Easton Lodge were also regularly supplied with armaments and stores arriving via Bishop's Stortford and Takeley station. After the invasion of Europe in June 1944 the line was used by ambulance trains to bring back wounded soldiers. After the war the public's use of motor cars and competition from bus transport increased, the passenger service between Bishop's Stortford and Braintree ran virtually empty and inevitably, closure of the line for passenger traffic was announced. Despite public protests, the last train to run between the two towns was on 1 March 1952. Despite the loss of the passenger service after 83 years the line was kept open for freight traffic, which was still an important source of revenue. But by 1968 more and more freight was being transported by road and the branch line now became uneconomical to keep open. By the end of 1971 all freight traffic had ceased, and on 27 July 1972 a final enthusiast's trip ran from Bishop's Stortford to Easton Lodge and back. By the autumn of that year most of the track had been taken up, apart from the last mile out of Bishop's Stortford. British Rail were considering the possible role this section of line might play in carrying additional traffic to a growing Stansted Airport, but proposals came to nothing and in 1974 the remaining track was removed. Takeley had a single platform on the north side of the line. 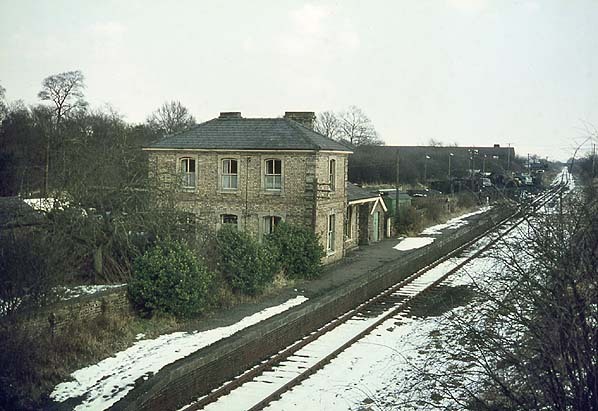 There was a substantial brick building including station masters house, booking office, waiting room and lamp room. There was a small goods yard, also on the north side with a 240' siding used mainly by coal merchants. A second siding also served a D.A. Fyfe and Sons warehouse. A signal box was located on the up side of the line. Although the station closed to passengers in 1952 August Bank Holiday excursions continued to use the line until 1964. 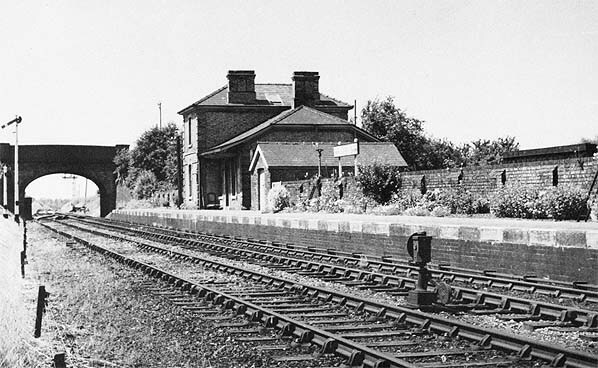 Takeley Station in September 1968 - the passing loiop to the left has been lifted by this date.